Giving Cowley College an opportunity to communicate with students in a way they never have before, the Cowley Mobile App (CowleyGO) will launch in the Apple and Google play store on July 1. The College’s Board of Trustees learned this and more during Monday night’s monthly meeting held in the McAtee Dining Center. Cowley is working with Modolabs to enable college students to easily create compelling, rich mobile websites and other data repositories which transform into a primary source of communication for students. According to Cowley College vice president of institutional advancement, Dr. Kori Gregg, the July 1 launch date is intended to create a mobile experience for first time Tigers on campus. Immediately following this phase, phase two will move towards all current students. At this time a student collaboration team will be established to help drive relevant content. A team of Cowley members from multiple departments will receive back-end training in the coming days to control content and functionality as additional personas are established including prospective students, parents, and alumni. 1. 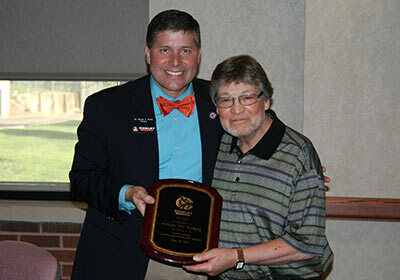 Cowley College president Dr. Dennis C. Rittle provided a College update. Dr. Rittle thanked Kristi Shaw, executive director of enrollment management, and the admissions staff for working together with other groups on campus to promote fall enrollment. Dr. Rittle then showed the Board a promotional video on the Cowley College campus coming to Sumner County. Dr. Rittle also showed a 30-second video of aerial footage of the main campus in Arkansas City taken by the College’s new drone. 2. Dr. Rittle filled in for Jessica Lucas, Sumner County Campus Campaign Champion and Strategist, to provide the Board with a legislative update. There are four candidates filed for the one Sumner County Board of Trustees position and seven candidates for the four Cowley County Board of Trustees positions. The update also said the House Appropriations bill included the restoration of 1 percent of funding for fiscal year 2018 and 2019. This was at odds with the Senate’s position. After negotiations in conference committee, the Senate position prevailed, leaving only the addition of ½ percent for community colleges in fiscal year 2019. Efforts will likely be made in 2018 to restore additional funds for community colleges. Lastly, College’s need to be prepared to allow guns on campus on July 1, 2017. There was no provision made in any legislation to exempt college campuses. 3. Dr. Rittle presented Bill Docking with a plaque in recognition of his serving as the keynote speaker at the 2017 Commencement ceremonies. “What a great friend we have in Bill Docking,” board Chair Bob Juden said. 4. Approved fiscal officers of the College to execute payment of all bills and claims as presented with general operating funds of $898,999.83, financial aid funds/student refund checks of $82,569.34, federal funds of $317,200.57, and Foundation funds of $174,849.86. 5. The Board authorized, ratified and confirmed the previous execution of the Interlocal Cooperation Agreement, entered into as of March 20, 2017 between Sumner County, KS and Cowley College by Board Chair Bob Juden and Board secretary/clerk Tiffany Vollmer. 6. The Board approved the naming of the roads around Cowley College’s Sumner Campus. The roads will be named in honor of Sumner County Economic Development executive director Stacy Davis, Wellington Chamber of Commerce director Annarose White, Sumner Campus campaign champion Jessica Lucas, Wellington Mayor Shelly Hansel, and Board members Dennis Shurtz and Bob Juden. These individuals were influential in helping the campus become a reality. 7. Authorized Chair Juden to sign the documents related to the transfer of the Bowman Estate property donation. 8. Approved the continuation of the current Board appointments through January 7, 2018. 9. Trustee Jill Long and Dr. Rittle attended the Quarterly KACCT/COP meeting June 9-10 at Colby Community College in Colby, KS. Long will be a featured speaker at the next KACCT/COP meeting September 8-9 at Butler Community College in El Dorado, KS. 10. Authorized Chair Juden to sign the resolution authorizing the revisions to the Interlocal Agreement of the City of Arkansas City’s Neighborhood Revitalization Plan. Arkansas City manager Nick Hernandez spoke at the meeting. 11. Approved the change in location of the July 17, 2017 Board meeting to be held at Cowley College’s Mulvane Center. 12. Approved the following policies: (145.00) Pets/Animals and College Facility Policy – Emotional Support Animal (ESA); (428.00) Title IX; (452.00) Varsity Athletics; (182.00) Naming of College Facilities; and Financial Stability. 13. Held a first reading on the Firearms Policy. 14. Approved the 2017-18 proposed operating budget of $22,311,796. 15. Approved a 2.75 percent cost of living raise for Cowley College employees. 16. Approved the administration’s request to spend approximately $140,855 of anticipated surplus on 2017 end-of-year projects, thus, leaving approximately $186,734 going to the fund balance reserves. The administration has identified key projects to complete by August 31, 2017. 17. Approved the recommendation to have current audit firm Swindoll, Janzen, Hawk & Loyd, LLC, to provide financial statement audit services for the next five years for a cost not to exceed $62,500. 18. Approved the purchase of campus video surveillance camera systems, maintenance, installation, and network equipment from Gateway Wireless. Cost for this project will come from the Capital Outlay Mill. 19. Approved the purchase of a new HVAC system for the Brown Center from Kruse Corporation. The 300 ton Trane Chiller will be purchased at a cost not to exceed $200,000. Cost for the project will come from the Capital Outlay Mill. 20. Approved the request to enter into a contract with Conco Construction for construction services for the Cowley College Sumner Campus for a cost to include the pre-construction service fee, general condition fee, and overhead and profit fee proposed with appropriate negotiation. Conco will donate the pre-construction fee as an in-kind gift to the college. Additionally, the college will not be billed until the project is in the construction phase. According to Dr. Gloria Walker, Cowley College vice president of finance and administration, four construction firms submitted proposals for construction services. “I appreciate all the vendors who put in bids. Picking one was very hard,” Dr. Walker said. 21. Dr. Gloria Walker, vice president of finance and administration, provided a timeline on various functions/activities to complete construction of the Cowley College Sumner Campus. 22. Dr. Harold Arnett, vice president of academic affairs, informed the Board that Cowley College’s CNA and CMA classes had exceptional pass rates of over 90 percent. Dr. Arnett also spoke of the successful On Course training and Difficult Airway course that were held at the main campus. 23. Dr. Kori Gregg, vice president of institutional advancement, said the recently purchased drone will finish shooting aerial footage of the main campus later this week and will then be used to gather aerial footage of the College’s other Centers. 24. Paul Erdmann, vice president of information technology, provided the Board with an update on the Student Information System He also spoke of the Jenzabar Annual Meeting that employees in his department attended. 25. Kristi Shaw, executive director of enrollment management, said the main campus recently enrolled 102 new students into the New Tiger Orientation for Fall 2017. She also said Fall enrollment is ahead of where they were at this time last year. 26. Paul Erdmann filled in for Chris Hollon, to provide an institutional effectiveness update. Hollon recently attended the Jenzabar conference where he met with a Zogotech representative. Hollon also attended the KBOR data quality conference. 27. Jason O’Toole, executive director of student affairs, provided an update on the dorms. He also shared information on the end of the year celebrations held by the IMPACT and Upward Bound programs. 28. Shane Larson, athletic director, informed the Board that Cowley College had 41 student-athletes qualify for national academic honors, while seven Tiger teams averaged above a 3.0 cumulative GPA qualifying them for team academic honors. Larson also said 36 wrestlers have already committed to be a part of the inaugural team in the Fall. 29. Accepted a letter of resignation from Jacey Camac as admissions representative, effective May 30; accepted a letter of resignation from Gavin Brown as dorm manager and intramural coordinator, effective June 1; accepted a letter of resignation from Brandi Gibbs-Herman as admissions representative, effective august 3. 30. Approved the employment of Lynlea Bartlett as director of housing, effective June 20; approved the employment of Hanna House as admissions representative, effective June 20; approved the employment of Stefani Jones as advisor/retention coordinator, effective June 20; approved the employment of Seth Moore as assistant men’s tennis coach, effective June 20; approved the employment of Janet Winegarner as grounds/custodian, effective June 20; approved the employment of Kyle Hays as English instructor, effective August 1; approved the employment of Paige Winslow as cosmetology instructor, effective August 1. 31. Held a 30-minute executive session for discussion on non-elected personnel and property.